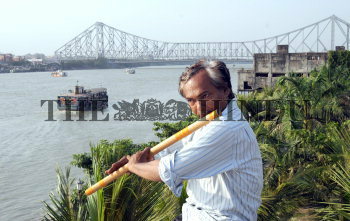 Caption : Kolkata: Nripendra Krishna Roy, the Joint Commissioner, Sales Tax of West Bengal State Government playing flute on the bank of river Hooghly on Saturday afternoon. He claims that playing flutes with Magha Malhar and Mianki Malhar ragas would bring the rain in absolute blue sky. According to Mr. Roy, since the year 2005, he could make the difference by bringing rain within 48 hours by playing flutes in those ragas during the hot spell of summer at various places. Moreover, he conveyed that he is pursuing the matter with agriculture department in Central Government to take this kind of steps to prevent drought or drought like situation in the country. Photo: Arunangsu Roy Chowdhury April 24, 2010.